A stock rocket called 500t-LKO-Lifter. 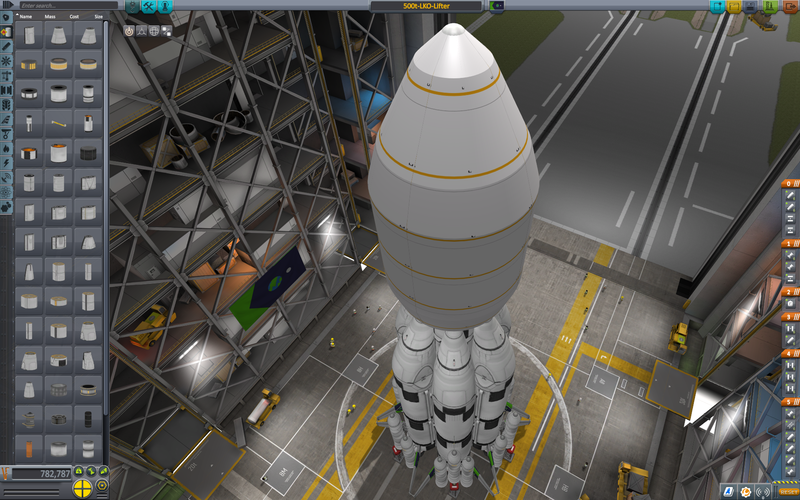 Built in the VAB in KSP version 1.2.1 with 339 of the finest parts, its root part is probeStackLarge. I designed this lifter for a gravity turn with minimal manual intervention: follow prograde, tip over east to cross 80 degrees at 90m/s, maintain full throttle from start to finish until apoapsis gets over 80km, stage whenever empty. The rocket does most of the flying. Detailed ascent profile is listed below. Set full throttle and SAS on stability. Stage for launch and change SAS to follow prograde immediately. Keep throttle on full. Nudge gently right/east right from launch. Try to cross the 80 degree mark when at 90m/s for best results. Stage SRBs right after flameout. They will mostly self-destruct when clear from the center stages. Stay at full throttle. Stage outer Mammoth boosters right after flameout. They will clear away from the center stage. Stay at full throttle. Stage fairing when crossing 55km (it will save some dV which can be used for a few km higher orbit, or for rendezvouz). Burn center Mammoth at full throttle until empty, then stage. Stay at full throttle. Burn aerospike cluster end stage until apoapsis reaches around 80.5km. Throttle down and coast. You should have a 7-8 minute break before the next burn. Apoapsis will drop a bit but will stay over 80km. Deploy panels, radiators and antennae (AG 9, 8, 7 resp.) if you wish. Set up your circularization burn at apoapsis (25-30m/s, ~12s burn at full throttle). There should be plenty of fuel left for this. Zero out inclination if desired. NOTE: Fuel remainder in the end stage may not be enough. It should allow for about 1.5 degree max correction; more than that is not a problem but may require you to enable crossfeed on the docking port and using some of the payload fuel. Transfer any remaining fuel from the end stage to the station (there is some room, by design), then stage to deorbit engine block. The engine cluster will deorbit itself. For full lifter stability, the configured autostruts expect/require the payload to include a part equally massive or more than a fully fueled S3-14400 tank in 3+ symmetry. The lifter tanks are slighty less than full on purpose, to trick the autostrut system! Change at your own peril. Spontaneous disassembly, or the payload spontaneously detaching itself from the lifter when physics ease in on the pad, are indications that the autostruts are not connecting the intended/required way. Revert to VAB and correct. The outer Mammoth boosters have a clipped fuel line (top outer rim of the bottom tank) and clipped strut (top outer rim of top slanted tank) that are supposed to connect to the central stage. Whenever you reattach/reposition those boosters, check that those are connecting correctly again. I have left some struts on the SRBs and the booster tailfins, even though the autostruts render them mostly unnecessary, because in a few attempts without those the end orbit ended up with several degrees of unwanted inclination. You can save parts and improve computer performance by removing those struts, but expect the inclination to show more variance as a result (this is not a problem but may need you to use some payload fuel for final orbit). The end stage is intended to be customized to the payload mass and target orbit. Keep in mind that the fairing shape does have some effect on the ascent efficiency: if your payload allows for a thinner pointier fairing, you’ll have more dV to play with, and the reverse will be the case if your payload needs more width. The variance can be about a plus or minus 3-5% given the same payload mass. My visual copy of the payload seemed rather barebones, so I added probe core, batteries, reaction wheels, RCS, panels, radiators, antennae and lighting to make it more functional, and I clipped some additional tanks into the empty structural space to bring the total payload mass up to an even 500t (actually 501t in the end). Center tanks of the payload were emptied one notch to ‘trick’ the autostrut system, forcing it to pick the 4x symmetry outer tanks for the heaviest part end point. This enhances rigidity of the entire lifter assembly considerably due to the autostrut ‘heaviest part’ connecting in symmetry to all 4 outer tanks. The lifter is one of my own designs from previous KSP versions, now taking advantage of the 1.2 autostruts to eliminate most struts and lower part count. It is aimed at minimal manual intervention for a natural gravity turn into LKO.